Travel Wonders World AMERICAS EUROPE Pack up and come to El Nido just as soon as you could! Pack up and come to El Nido just as soon as you could! If we say that the Philippines is a treasure for the followers of the sea, with beautiful islands like pearls on a string attached stone, the El Nido would be the brightest jewel there. There are countless reasons for you to make an "immediate and always" trip to El Nido, Travel World Wonder will help you to find out those reason. 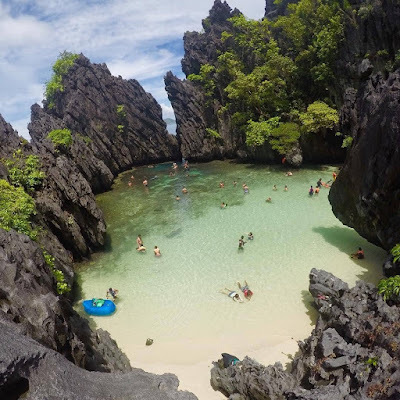 Located at the end of the Palawan Island, about 420 km away from Manila, El Nido is quiet and graceful as a rough gem has yet been discovered. In El Nido, you can enjoy sunbathing, snorkeling and visiting smaller islands or secret swimming places on the boat. When you are boring, you can be lounging on the white sand shore, listening to music and relax, you will be refreshed quickly. People calls El Nido the land of the dragon because of its majestic landscape made of plenty of limestone will different size and shape. These rocks are scattered on the sea, linked together to form a community ecotourism extremely attractive. Besides, El Nido has become even more attractive with the beach, white sand, mangrove forests and mysterious caves. Filipino people are very conscious of conserving natural landscape here, you will be surprised when the town is landlocked, and the coast is very clean. Pristine landscape with unique flora preserved carefully making it one of the true treasures of the Philippines. From Hanoi or Ho Chi Minh city you can book a ticket to Manila, you should book through Cebu Parcific Air for several months, return air tickets has the price at about $80. The flight will take you for about two hours and a half. After that you can set the next flight to Puerto Princesa city, and then catch a bus of Cherry or Roro brand to El Nido. 6. The language barrier is not a big problem. Apart from the local language, the Filipino people are using English as a main language in daily communication. Therefore, you will have no difficulty in communicating if you have good English skills.